A suicide bomber has hit a government building in eastern Afghanistan, killing 16 people, 14 of them children, local police said. A doctor at a hospital in Khost said 58 people - many of them children - were hurt in the attack, close to a school. Earlier, two Canadian soldiers were killed by a roadside bomb in Panjwayi district, a Taleban stronghold in southern Kandahar province. An Afghan interpreter and a policeman working with them were also killed. "These soldiers died honourably, helping bring security to Afghanistan," said a spokesman for the International Security Assistance Force (Isaf) in a statement. Taleban rebels have stepped up attacks on Afghan and foreign troops this year. The deaths took to 106 the number of Canadian soldiers killed in Afghanistan since their mission began in 2002. 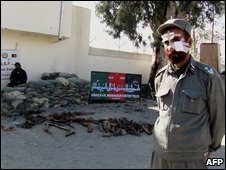 In Khost province, the attacker detonated an explosives-laden car he was driving when police opened fire to prevent him from reaching the government building where officials were meeting. Police said tribal elders and local leaders were holding talks with the district governor about security and planning for next year's presidential elections.